It's JULY now- can you believe it? I have been stuck at home every day and so this summer has been weird. I just found out that my appliances and the last 1/2 of my countertops will be installed tomorrow. I will miss Zach at his 4th of July baseball tournament. He has two games tomorrow. I am about to cry. I feel SICK to miss his games- such big tournaments. They are about an hour from my home- and I need to be home to supervise all the work. Sorry to whine- it's just been a nightmare. I wish I could say I have all my CHA projects done- the trade show is in Chicago. I leave in 14 days to go to the show. 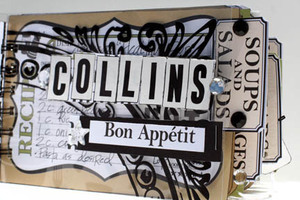 I will be teaching at Windy City Scrapbooking- two weeks from today. So looking forward to this. Also, an update on Taylor. She moved to Oregon on Monday. She is working for her aunt at her dental office. Taylor graduated with her dental assisting certificate from high school and has done an internship her entire Senior year of high school. She was offered this amazing job and will live with her Uncle and Aunt, and take classes at college too. She is doing the dental program. She loves to work with people. My 17 year old baby moved out- and so she calls me EVERYDAY. It has been a huge blessing. I prayed about it, and KNEW she was making the right choice when the opportunity came. She will fly back home in two weeks to travel with me to the trade show. OKAY- another layout to share from the collection. 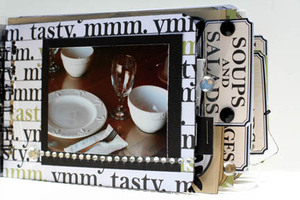 Also, if you are looking for my products, you can go to www.papercraftsource.com and put in your zip code. The stores that carry my product should be listed. If you are a store that carries my line make sure you are on this list. This is a store locator. This layout is using the measurement paper. I wanted to do a page about my kitchen pre-remodel. 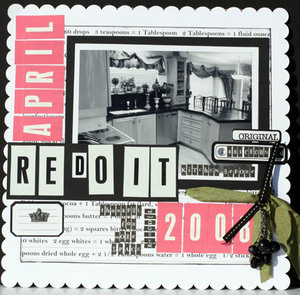 Since my background is Interior Design- I like to scrapbook, my home. I know years from now, it will be a great reminder of my children of where they grew up. I am sure they will look back and see how dated the house and furnishing have become. After my mother passed away and I visited her home, I took hundreds of photos of the house I grew up in. Such great memories!!!! Happy Wednesday everyone- keep posting your comments for the prizes. Here is a couple visuals of the line- a few projects for the CHA S booth... So this a project of MY FAVORITE recipes. It was so easy since all the labels, papers- everything was my newest collection. YOU can SEE all the paper designs by visiting my website. Okay, now I want to share ONE layout that I did with the collection. Each day this week- you can come back and see inspiration from this line. Here is a layout using ONLY my new papers. Here is the journaling within the frame- This is our family tradition. When we all sit down together at night for dinner- we all go around the table and everyone takes turns telling about their day...June 2008. So a behinds the scene about this collection. 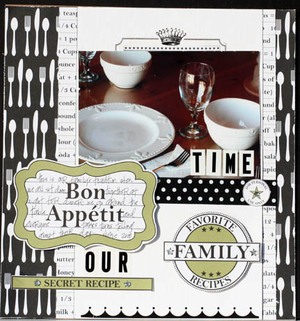 I wanted to do a really beautiful line (green, black, tan and white) that would help document our cooking, eating, recipes, etc. memories. 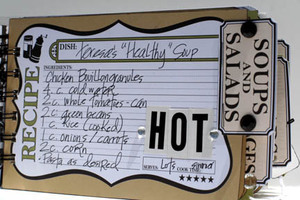 For one sheet of paper (retails .70 cents) you get SIX recipe cards. 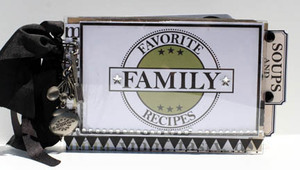 They are double sided and so you can really design your own recipe box, book- whatever. I am the FIRST to admit- I am not a cook!!! So why in the world would I design a cooking line? Simple, because I eat everyday- we all do. I still have to feed my kids and I want to capture photos of my family baking, eating, cooking, etc. This line will make it easy and hopefully inspire you to document such a important part of our EVERYDAY life. Start taking photos of your kitchen, your table, your favorite foods...because THEY are memories!!!!! Okay, some of you who KNOW me- are you shocked? I can't wait to show you more projects from this line. I'm going to start cooking lessons in the Fall. I have been re inspired to cook more. So here is the deal. This week I am giving away some great prizes. Here is how it works- I will pick TWO winners on Saturday July 5th. I will be giving away a DREAMKUTS machine. Remember, my demo using it on my website??? It's valued at $90.00. Wow...and it's the ULTIMATE machine. I also am mailing ONE lucky person the new BON APPETIT collection of papers and some other goodies too. You can win the new (no one has these paper!!!!) papers or the DREAMKUTS machine simply by posting what is your favorite paper from the newest collection. Yes, visit the website and then leave a comment. To make it fair, you can leave a comment every day that I post. I will pick the winner from all the comments. Post as much as you want. 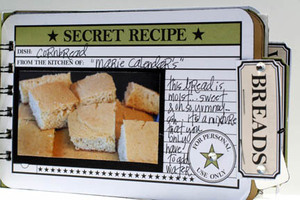 Hey, post a recipe...anything. I am so excited...and any comment you post this entire week will make you eligible to win the TWO prizes. I always get nervous showing my latest and greatest...so I'm looking forward to hearing your thoughts. Also, good luck...and check back EVERY day because you will be able to get some ideas on how to use the line. Oh, and YES- the top project I posted will be a KIT...offered to you. If you like and want to purchase it- this will be the kit that all proceeds will be donated to the JENKINS family who are dealing with colon cancer...email my assistant (my daughter Gentry) at teresac8@msn.com. She will let everyone know the cost and all the information after she gets the list of everyone interested. I want to be able to help my friends financially. The kits will not ship until after CHA S in August. Have a fantastic day!!!! FINALLY- the PHOTOS were loading. Now I can RELAX. Yes, post a comment here. Visit my website to see the collection. 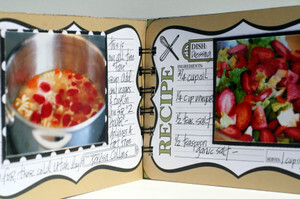 I would LOVE to have some simple recipes- stress the word- simple...ha! Thank you all for your patience. I had thousands of hits on my blog yesterday and I felt horrible that I could not get my post posted as promised.